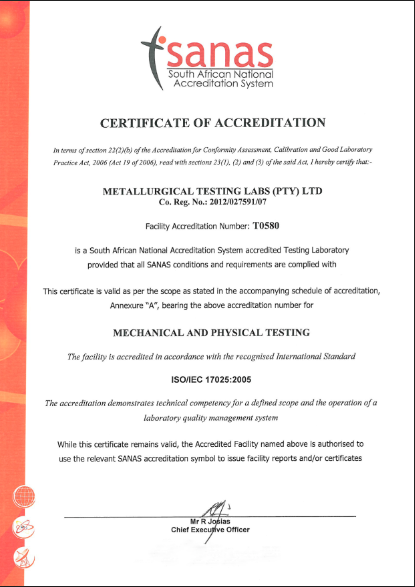 etallurgical Testing Labs is committed to service excellence, traceability and quality which is why SANAS 17025 Accreditation is taken so seriously and why it is implemented to all aspects of our business. MTL acquired the SANS 17025 Accreditation and received the formal documentation in December 2012. Keep an eye on this space for updates with respect to our progress with respect to this matter. SANAS Approved our Quality Manual. The full Audit is scheduled for the last quarter of 2012. SANAS Audit took place with the outcome being that MTL was recommended to recieve the SANS 17025:2005 Accreditation for all of the diciplins that it had applied for. MTL received the official documentation as proof of its accreditation. MTL extended its scope as per points 1-8 above and added an additional 2 Technical Signatories to its accreditations schedule. Our aim is to bridge the gap between supply and demand. We strive to become a “one stop” service provider for companies and individuals that have a need for material testing which offers up results that they can trust. At the same time Metallurgical Testing Labs understands the concept of investing back into the industry which is why it participates in programs associated with the training of Metallurgical Engineering Students. It is with the above in mind that Metallurgical Testing Labs was formed.